Sometimes you just can’t seem to find exactly the costume you are searching for. Maybe you are entering a contest or hosting a party and just want something different or unique. Head to a Halloween store close to you and you are sure to find everything you need to create the vision you have. 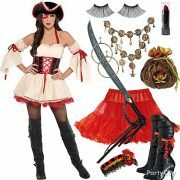 Glendale Halloween has all the accessories you will need to transform yourself into your alter-ego for the night. Check out the selection of Halloween wigs to give you the look you desire. They have men, women and children’s wigs to perfect any outfit. Check out the wide selection of masks, including scary masks, funny masks or even the popular presidential masks. If you don’t want to be hot or feel trapped in a mask, just make your own special facial transformation. You can find an extensive supply of make-up for Halloween at your Glendale costume store. Choose from cream makeup, liquid latex, spirit gum or even prosthetics to completely alter your appearance. Sometimes choosing the perfect mask or deciding on your makeup can be the beginning of creating your whole costume. Once your face is transformed, you can decide what you need to complete your look. Sometimes the perfect costume is available. Other times you will do better by creating your own look with different props and accessories you find. Take your time and browse to see what works best for you. Our Halloween store hours are daily from 11 am to 8 pm for your convenience. Whatever you decide, Halloween is the perfect time to be someone else. Or something else. Play the part. If you choose to be a creepy Jason or Michael Myers character, stay IN character. Remember, Michael Myers never talked. Walk around in silence, very slowly, and just stare at people while tilting your head. You will freak people out! If you choose to be a presidential candidate, mingle through the room and shake hands and hand out flyers or buttons. Be the part and convince people that you ARE your character. It will make your costume, and your evening, so much more enjoyable for you and everyone around you.